Loved the location, the clean and spacious rooms, the view, the delicious variety of food and restaurants on the property, the accommodating staff. Didn't like that the AC wasn't working for 2 days and our ceiling fan was broken. But, the staff was very helpful and brought us a stand up fan. Basic rooms with odd layout for family room. Not what we expected. The check in, I didn’t like because my room wasn’t ready when I diid my check in so I haved to wait for 1 hours. I would say this resort need do a little better on the food. Csuse there a lot picky people in world. Other then that the resort was great. 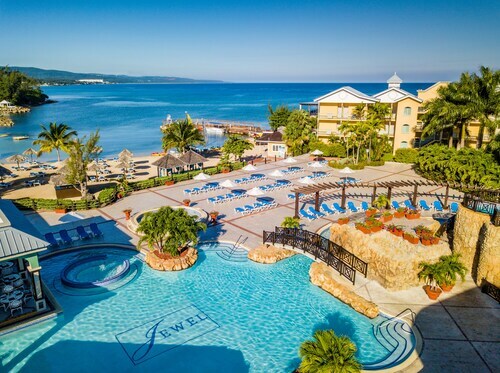 Montego Bay is a tourist destination in Jamaica well known for its beaches, picturesque mountains, great shopping, outdoor activities, and friendly, relaxed culture. Featured in popular song and film, visitors enjoy Montego Bay's year-round tropical temperatures and Montego Bay hotels provide a variety of accommodation options ranging from budget oceanfront hotels like the Casablanca, to luxurious resorts like the Tryall Club in Sandy Bay, and bed and breakfasts like the Polkerris on Corniche Road. 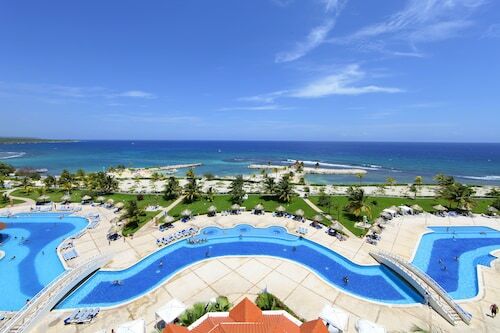 The Montego Bay Convention Center is a state-of-the-art facility that is the first of its kind in the Caribbean. With several meeting and exhibition rooms, the center regularly hosts travel and trade expos. Guests at hotels in Montego Bay should try the Montego Bay Seafood House & Oyster Bar for award-winning seafood gumbo. Visit Scotchies on Falmouth Road to experience authentic, spicy Caribbean flavors. Take a guided tour through the Montego River Gardens to an authentic Rastafari indigenous village. Also visit the historic Rose Hall Great House, an English-styled mansion, once the site of a large sugarcane plantation. Take a guided tour through this supposedly haunted location. 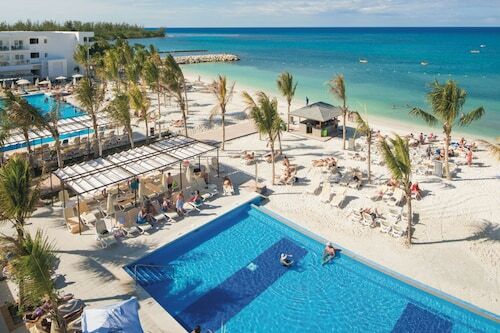 The Half Moon Shopping Village, just east of hotels Montego Bay, offers visitors an upscale shopping experience, as well as a Bob Marley exhibit, and an English-styled pub. Visit the Ras Natango Gallery and Garden for authentic gifts and souvenirs. Visit Rocky Point Stables for horseback riding adventures, visit the Cinnamon Hill Golf Course at Rose Hall, or enjoy swimming and snorkeling at Doctor's Cave Beach. I enjoyed the cleanliness of the pool and the staff was excellent! The staff is the best part of this resort. Friendly, helpful, quick to serve! Check-in and out were quick and easy. Shaquine, Rahime and Maurice were the best at entertaining us. The whole place is kept very clean and organized. Being a small resort, it is very quiet and relaxing. Not the party crowd as in other resorts we've gone to. They have a good variety of excursions you can purchase, but we just went to the 2 excursions they provided for free. I've never had a resort do that before. There were only 2 negatives about this resort. One was the beach. It was small and very shallow (barely 4 feet deep). The other was the food. Very little variety in the buffet, and the special restaurants had the same menus all week. Overall it was a great resort to sit back and re-charge.